This is a guide to efficiently reaching exalted reputation with the Wintersaber Trainers, an Alliance-only faction found in Winterspring. The grind is is notorious for its long duration and repetitiveness, and will take far longer to complete in Classic wow than it did post-BC changes. Anyone patient and determined enough to actually complete the run will eventually be rewarded with https://classic.wowhead.com/item=13086, a unique epic mount with 100% run speed. You must be an Alliance race and be a minimum of level 58 to begin any quests. The total number of reputation points required for Exalted is 42,000. There are only three repeatable quests that contribute towards your reputation. 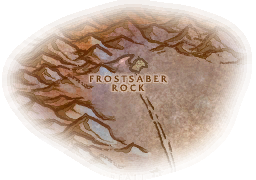 These three quests are given by https://classic.wowhead.com/npc=10618, who can be found perched on top of Frostaber Rock. The first repeatable quest is available immediately (you start at 3000 rep - Neutral), second at 4500 rep, third at 7500 rep. The quests take place exclusively within Winterspring. So that's only 175 reputation per cycle if you are able to pick up all three quests. Hopefully this puts things into perspective a bit - even if you play a substantial amount of wow and are super-focused the minimum time to reach exalted with Frostsaber Trainers is over 2 months! Tip: Roll Human If you want to make things a bit easier on yourself (and your friends, family, children too). The racial trait https://classic.wowhead.com/spell=20599 will net you 55 rep (+5 bonus) for each of the first two quests handed in, and 83 rep (+8 bonus) for the last quest handed in. This will reduce the grind time significantly. I would not recommend grinding Wintersaber Trainers rep without already owning an epic mount. As you will later see in the map I have prepared, there is already an enormous amount of travelling time involved in the run. If you attempt this with a 60% run speed mount, thereby slowing the process by 40%, you are going to cry your sorry eyes out. Finally, it is worth bearing in mind that your level cap is 60. The majority of the mobs you are farming for each quest are also levels 58-60. It will take you longer to down these than you might expect. On top of that, if you're on a PvP server you will know that Winterspring is a contested area and therefore you run the risk of being ganked by Horde looking for rep farmers such as yourself (delicious tears). Tip: If you have some friends who also want to grind out saber rep group up with them and nuke the place together to share kills - this will shorten each quest's completion time. You will have a lot of competition in Winterfall Village. 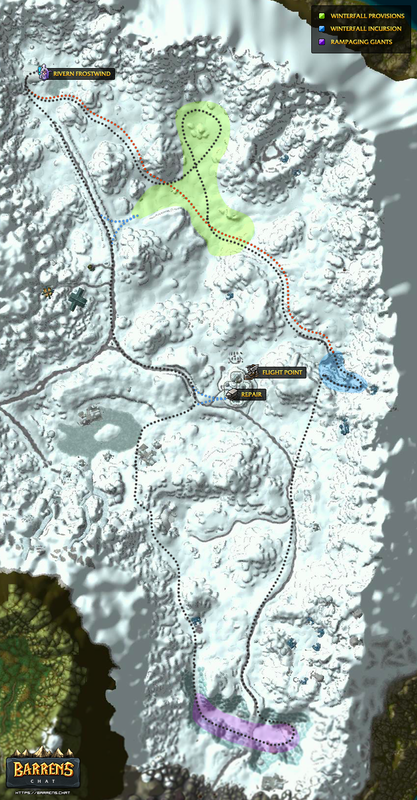 Below is a map of Winterspring that highlights my recommended route of a full cycle (all 3 quests). I have also marked the positions of Rivern Frostwind, a repair point and the flight point in Everlook. The black dotted line is the recommended walking route and the coloured areas depict the location of quest objectives. The red dotted line is an alternative route that you may take - I will explain in a moment. You can do either direction but I prefer to head east first and tackle provisions, then incursion, then giants. On the way back you pass near Everlook (and can make a short detour in case you need repairs). Further north on the return route you can make a small detour eastwards again to pick up any remaining provisions you may have missed on the way down. Alternative route: If you are on a low population server and Winterfall Village isn't too busy with other farmers, then you can consider completing only https://classic.wowhead.com/quest=5201/ ... -intrusion for your cycle. You will be dismounted by Chimaera in the green area whilst running back and forth - if this happens just kill them and loot any meat on them. That way it becomes efficient by letting you turn in https://classic.wowhead.com/quest=4970/ ... provisions every once in a while. Of course the main reward of this rep grind is the beautiful https://classic.wowhead.com/item=13086. It will cost you 800 to purchase from Rivern. The tooltip says it requires Tiger Riding but in reality this is not the case - you don't need to be NE to ride it. Interestingly it is the only 100% speed mount that requires just 75 run speed to use. Gold! Lots of it. Winterspring is rich in ores, herbs and beasts to skin. You travel close to hills, through open areas, and incidentally slay a lot of beasts for the provisions quest - any Herbalist, Miner or Skinner will be raking in the resources. There is a banker in Everlook whom you may store your goods with. Rogues can pick pocket Furbolg too for extra income. You will actually hit exalted with Timbermaw Hold long before you reach exalted with Wintersaber Trainers. This is due to the large amount of Furbolg you slay in the Intrusion quests. Save all of the https://classic.wowhead.com/item=21383/ ... irit-beads that the Furbolg drop until after you hit revered with TH, as they are one of the only ways to gain TH rep after you reach revered with them. This is very well done. I still use the mount on retail as one of my favorites - so I can't wait to get it again! From an efficiency standpoint, would it be faster to skip the Rampaging Giants quest entirely? Visually, it seems the extended travel distance to the far south may not be worth the +75 rep.